From a deadly border to America's kidnapping capital--the secret lives at the heart of the immigration controversy Arizona's violent border is the busiest gateway for illegal immigration in America, making Arizona Ground Zero for the immigration debate. No state is as hostile to the undocumented, and no city is as unwelcoming as Phoenix. Yet Phoenix is home to thousands who live in the shadows, where civil rights are neglected and lives are lost. Illegal sheds light on the invisible immigrants who persevere despite kidnappings and drug wars, an ongoing recession, and laws barring them from working, learning, and driving. By profiling these undocumented people, and those--like notorious Sheriff Joe Arpaio--who persecute them, author Terry Greene Sterling courageously reveals the changing face of immigration in America and gives new insight into a divisive national crisis. 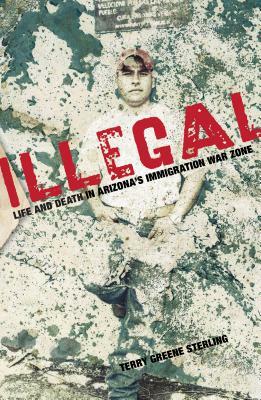 Terry Greene Sterling is a Spanish-speaking award-winning journalist and photographer based in Phoenix, which is ground zero for the nation's immigration wars and home to most of Arizona's five hundred thousand or more illegal immigrants. She is Writer-in-Residence and a faculty associate at the Walter Cronkite School of Journalism and Mass Communication at Arizona State University. She has covered all aspects of the American West, including immigration and Latino issues, for twenty-five years. She has won more than fifty national and regional journalism awards, including several awards for diversity writing. She is a three-time winner of Arizona's highest journalism honor, the Virg Hill Journalist of the Year Award, and was a staff writer at Phoenix New Times for thirteen years. Her stories have appeared in numerous newspapers and magazines, including The Washington Post, Newsweek, salon.com, The Nieman Narrative Digest, Preservation Magazine, Arizona Highways, High Country News, and PHOENIX Magazine, where she is contributing editor. She also has a Master of Fine Arts degree in Creative Nonfiction from Goucher College in Maryland, where she studied with Tom French and Walt Harrington, two master narrative journalists. She is a member of Investigative Reporters and Editors and The American Society of Journalists and Authors. Her blog on her experiences and findings investigating the "border battle" in Arizona can be found at whitewomaninbarrio.com, an intereactive web site that includes photos, videos, maps locating border deaths, book tour events, etc. She can also be followed on Twitter.